1) The 1.82-lb VGN-X505ZP was light enough, but had only 1024x768 resolution, 512MB of RAM and a 20GB 4200rpm HDD. It also lacked Wi-Fi, so I had to add a PCMCIA wireless card, making the laptop slightly heavier. 2) The 1.49-lb X Series (VPC-X113KG) was even lighter, but was extremely fragile especially the lid -- the screen got severely damaged after just one trip. Though its 1366x768 was better than the X505ZP's 1024x768, it was still very crippling. 3) The 1.23-lb P Series (VGN-P530CH) was not only yet lighter but actually small enough to fit in the front pockets of my pants, and 1600x768 was just wide enough to support side-by-side windows, but the screen was so small and short it was painful to use. And all three laptops required their own chargers, which added to the travel weight. It uses a standard micro USB charger, which I always carry for my phone anyway, so in a way I don't need to bring a charger for the Thinkpad 8. Its 8.3" 1920x1200 screen is just large enough (and tall enough, thanks to the 16:10 ratio) that it's reasonably comfortable to view, and is also wide enough that I can tile two windows, albeit tightly. I use Windows 10 in desktop mode and scale at 125%, effectively reducing 1920x1200 to 1536x960, but that's fine. I found a super light external Bluetooth keyboard that has a touchpad. The keys are fairly small but still allow me to type reasonably fast. 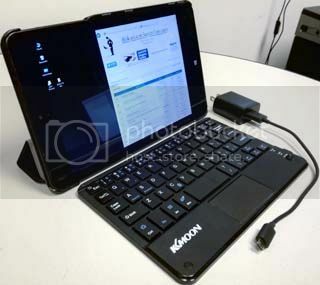 The case, designed specifically for the Thinkpad 8, works just like the Apple iPad Smart Case in that it has a cover that folds to create a stand that supports two viewing angles. The Thinkpad 8 + case + keyboard add up to a total of 1.58 lbs, which is certainly light enough. 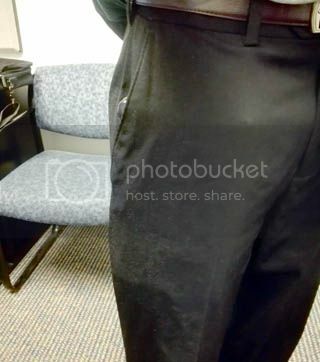 What's more, even though the case adds a bit of bulk, it still fits inside the front pockets of most of my pants, as can be seen in the second photo. Incidentally, I bought the LTE model from the UK, hoping to get at least 2G in the U.S. but unfortunately it doesn't work at all because it doesn't have any of the U.S. cellular bands. I forgot to test cellular connectivity while I was in China, Taiwan and South Korea a couple months ago. When I visit Hong Kong this fall, I will see whether it works there. I bet many other forum members also try to travel as light as possible. What laptop do you travel with? Last edited by pianowizard on Wed Jul 06, 2016 7:19 pm, edited 1 time in total. I *might* buy a X60 tablet (with SXGA+ panel, of course) for the sheer purpose of having a travel machine, but that task is really not high up on my "to do" list. pianowizard wrote: Incidentally, I bought the LTE model from the UK, hoping to get at least 2G in the U.S. but unfortunately it doesn't work at all because it doesn't have any of the U.S. cellular bands. Which one, Sierra Wireless EM7345 or Ericsson N5321gw ? The first is 4G/LTE and supports US bands the latter is 3G only. Both configurations were sold in EU. In case of EM7345 the issue is to get the right firmware version. There is a long thread in Lenovo forum regarding EM 7345 crappy firmware https://forums.lenovo.com/t5/ThinkPad-T ... -p/2193557 Do not use preinstalled EM 7345 driver/firmware, it does not work at all. Update it from Lenovo, for non-US countries I recommend to use a bit older version GTWO42WW because latest one GTWO45WW has broken generic firmware. I use the ThinkPad 8 as well as a replacement of my good old X31. The build quality is actually worse, I already had to replace broken touchscreen cable connecting the touch screen and system board. Otherwise I like it. It is better than 6" phablets with crippled mobile OSes and more mobile than big 10+ inch tablets. I used the TP8 for travelling a lot actually. It's an excellent device for media consumption IMO. And the screen is just gorgeous. Tasurinchi wrote: And the screen is just gorgeous. Well, it is not bad but excellent according Lenovo standards. TP10 has too low resolution for me. I can't stand 1280x800 on 8" tablet screen so 1920x1200 on 10" only is very likely the same pain. 8" tablets are dead for Lenovo while HP and Dell still have new "pro" models. Unfortunately the future of small devices are phones or phablets with their crippled OSes. I am tempted to buy Lumia 950 XL Dual Sim (excellent LTE bands support) when prices drops even more. Last edited by Puppy on Mon Jul 04, 2016 12:52 pm, edited 1 time in total. I don't really care that much about weight, although it is an important factor. I used to lug around a T61 with 9c, which became unbearable over time. Nowadays, I carry a T440s with me which weighs roughly 1.6Kg, which is ok for a fully fledged 14" notebook. The only lighter machine that I have is the 1.2Kg Yoga 900 with 13" screen, but I can barely notice a difference, so there is no need for me to upgrade at this point, although the 1.4Kg T460s is quite tempting. The 700-something gram Lavie Z is quite intriguing as well, but has several severe drawbacks like the keyboard and speakers. If I could afford one, the Panasonic RZ5 would be my on-the-go laptop. Puppy wrote: TP10 has too low resolution for me. Used to be my X220 Tablet. Then it became my Thinkpad 10 Tablet (1st gen), which I still use to lecture with. Write the notes in OneNote, lecture with the tablet in hand. It is a very fine solution for a math instructor. The screen size and aspect ratio makes it very bad for programming, however, so unless I teach that day I carry a "beater" X61 with T8100. I have another X60 chassis laying around in much better condition that I am going to install one of xiphmont's LED backlights into once I get a hold of an SXGA+ display from an X60 Tablet. And eventually an X62 motherboard if HOPE sells it abroad. ajkula66 wrote: I *might* buy a X60 tablet (with SXGA+ panel, of course) for the sheer purpose of having a travel machine, but that task is really not high up on my "to do" list. I have a Microsoft Surface Pro 2 (10.6", 16:9, 1920x1080, i5-4300U, 4GB, 128GB, 2 pounds) with Type Cover 2 keyboard (0.55 pounds) and I'm using it for short trips (1-2 days), but I still prefer (any of) my laptops over the tablet. Anyway, I'll be exclusively Surface powered in my two weeks holiday in Sicily this summer, hope I'll survive. Last edited by ajkula66 on Tue Jul 05, 2016 8:01 am, edited 2 times in total. I do a bit of travelling and I manage to get by with the X301 for which I have 2 batteries. If the battery life becomes an issue I would probably go for a Yoga or an X1. Normally if I want to use something on a plane or away from a power outlet I use my 5.5 inch phone which has a 5000mAh battery. I think the heaviest laptop I have ever traveled with remains my first Thinkpad, a 600E. That was between 2002 and 2003, when that 600E was my lightest laptop. I needed to back up my files onto Zip discs, so I also brought a parallel port Zip drive with a huge AC adapter. The 600E, its charger, the Zip drive and its charger probably totaled around 8 lbs! Though that 600E had a fully functional USB port, I didn't have a USB flash drive until 2004. Puppy wrote: Which one, Sierra Wireless EM7345 or Ericsson N5321gw ? The first is 4G/LTE and supports US bands the latter is 3G only. Thanks for the tip! I had tried connecting to the T-Mobile network once and it couldn't connect, so I just assumed that it didn't support 1900 MHz or 2100/1700 MHz. Puppy wrote: I use the ThinkPad 8 as well as a replacement of my good old X31. The build quality is actually worse, I already had to replace broken touchscreen cable connecting the touch screen and system board. Otherwise I like it. It is better than 6" phablets with crippled mobile OSes and more mobile than big 10+ inch tablets. Currently my biggest phone is 7.0" 1920x1200, the Huawei Honor X2, so the Thinkpad 8 isn't a whole lot bigger, but I completely agree that Android and other mobile OS's are too crippled. Until last month, my biggest phone was actually slightly bigger than the Thinkpad 8: the Samsung Tab S with 8.4" 2560x1600! It was great for surfing the internet, but carrying it daily in my pants pocket was too much so I finally downgraded to my current Huawei. I was also unhappy with the Tab S's battery duration. Puppy wrote: Unfortunately the future of small devices are phones or phablets with their crippled OSes. I am tempted to buy Lumia 950 XL Dual Sim (excellent LTE bands support) when prices drops even more. Doesn't it run desktop mode only when docked? If that's not the case, I should look into this phone as well. 600X wrote: I don't really care that much about weight, although it is an important factor. I used to lug around a T61 with 9c, which became unbearable over time. Nowadays, I carry a T440s with me which weighs roughly 1.6Kg, which is ok for a fully fledged 14" notebook. I travel with my Thinkpad 8 only on trips when I plan to do extremely light work. When I expect to work more, I grab my Sony Pro 13 (13.3" 1920x1080 touchscreen, 2.23 lbs, average-sized charger). If I ever need to do very heavy work while traveling, I can visualize myself carrying my recently acquired Dell Inspiron 15-7568 2-in-1 (15.6" 3840x2160 touchscreen, 4.64 lbs, smaller than average charger). 600X wrote: The 700-something gram Lavie Z is quite intriguing as well, but has several severe drawbacks like the keyboard and speakers. Which is why I think I would like my Sony Pro 13 more than the Lavie Z. If I remember correctly, Puppy uses the tablet mode on his Windows tablets. 1280x800 on 10" is acceptable in desktop mode, but too low in tablet mode. But you are a U.S. citizen, no? And I bet you sound more American than when you first moved here, even though you may not be aware of it. shawross wrote: Normally if I want to use something on a plane or away from a power outlet I use my 5.5 inch phone which has a 5000mAh battery. Yeah, if I am away from home for just a day or two and don't need to get any work done, I bring just my 7" phablet. I've known George for many years and I can tell you that he is NOT a US citizen (and never will be), and that he definitely does NOT sound American at all! pianowizard wrote: If I remember correctly, Puppy uses the tablet mode on his Windows tablets. 1280x800 on 10" is acceptable in desktop mode, but too low in tablet mode. But you are a U.S. citizen, no? pianowizard wrote: And I bet you sound more American than when you first moved here, even though you may not be aware of it. Puppy wrote: Congrats, 15000 ! But aliased rendering is acceptable, right? Text looks jagged, but sharp. Yes, the five of us Thinkpads.com forum members had a fun gathering in NYC. A few days afterward you and I chatted over the phone as well. But these interactions don't enable me to tell whether you sounded less American when you were a new immigrant. How do you pronounce the "o" in words like "positive" and "possible"? I bet you pronounced them differently 17 years ago. pianowizard wrote: But aliased rendering is acceptable, right? Text looks jagged, but sharp. Yes, that's what I use on these low PPI desktop and laptop displays. Unfortunately Windows 7 is the last version where you can turn ClearType completely off, in 8.1 and 10 it is partial only. But this is not possible to use in tablet (Windows 8.1 Metro) mode which is the only useful mode on such devices. Otherwise aliased text looks very good on 8" 1280x800 tablet with 100% zoom in desktop mode. My current travel computer is my Thinkpad 8. Former have been a HTC shift, an OQO 01+ and a Fujitsu F-07C. All the formers became too slow for most tasks, unfortunatly... The Fujitsu can barely keep up for any work by today.. But it is by far my ligthest travelcomputer at 218 grams. So i still keep it, and use it now and then.. But not much. Interesting concept, especially the mechanical keyboard. Unfortunately there is no mobile Internet connection. I just sold my T410 to my co-worker because for months I have only used my Surface Pro 4. Before that I would switch off between my Surface Pro 2, X301 and T410. I am now considering selling my X301 as it hasn't been used in many months. I will keep the SP2 because I do use it on occasion and I enjoy it in tablet mode. At home I switch between a Latitude E6520 and Precision M4800. Sometimes I use the SP4 if I am just browsing reddit or whatever. Has to be an x series. Nowadays its a X200s. Been overseas with me quite a few times. Cheap enough nowadays to not worry if damaged or stolen. Before it was an x60/61s. If im only away for a week or so on vacation i normally do not bother. It is nice to have a break from the puter. However anything 2 weeks or longer i will take one. Though i normally do not switch it on for the 1st week . I used to travel with "X" Series machines (traditional, non-X1), till my eyes got bad. Then, I went from an X300, to X301, to X1 and now a T430s. I don't travel as much as I used to, plus the combination of: hate low resolution screens, and not being able to handle high res, small one has led me to my current T430s. I must say though, it's a bit like visiting home since I used to carry a the various "T" series machines before my time with the X's. I tried the ThinkPad 8 Tablet for a while, but HATED the Windows 8, didn't care for the W10, so when back to an Android tablet since I don't use them as a computer, but as a reader mostly. Now I have an nVidia Shield Tablet for that job. It's just the right size and weight for me. I've upgraded from my Surface Pro 2 to a Surface Pro 4; bigger (12.3" 3:2 vs. 10.6" 16:9), slimmer, lighter, fanless (got the m3 model), much better keyboard, it's awesome, I love it. I might be able to get away with a 10" but have settled on my X300 X201 T400s. IMO the reduced form factor and weight is a boon over even full sized T420 14" units. Never away from a socket so that's not an issue but the std and ultrabay battery is more than enough.